Re-entry goes like this: We spend the morning cleaning and organizing, doing inventory, making some last journal entries, snacking, and making ourselves presentable to the world. Basically, trying to stay busy to distract from the anticipation of our emergence. During midday, we shoot past the moon, firing our thrusters to adjust trajectory and make our final alignment with earth. About an hour before our expected water-landing, the 4 crewmembers gather in the Level 1 module to watch video footage of the re-entry. We are excited. I feel a bit nervous, not knowing what to expect when the door opens. The parachutes deploy, we hear wind, we wait. Shortly after splashdown, the fanfare begins, and the door opens to the tune of Stars and Stripes Forever. To see that door open is a strange feeling, as if I forgot it was even possible that we could leave our cozy habitat. We’re glowing as we march out and see the welcoming party. Pete and Mom are right up front and I see them first. I see my friends Sylvia and Mark, and all the folks from Mission Control. I’m happy, and there is one more duty. As commander, I am charged with a mission-complete speech, transferring the command of Graphos back to the Flight Analog Team and ringing a bell in the old nautical tradition. And that’s it. We mingle and drink sparkling cider. The carbonation strikes me as magical after 45 days without a carbonated drink. We experience two egresses that night. The first is from the HERA habitat into Building 220, the warehouse containing all the HERA systems. The second egress, from B220 out into the fresh air, is just as wonderful. The air in Houston was wet and warm, the wind was on us as we walked across the asphalt, and the moon was nearly full. It felt good. Celebration is limited the first night because by the time we get back to the hotel it’s nearly 11 pm and we need to be back at NASA early the next morning for follow-up tests and biological samples. Our debriefing duties to the HERA mission officially end a week after egress. 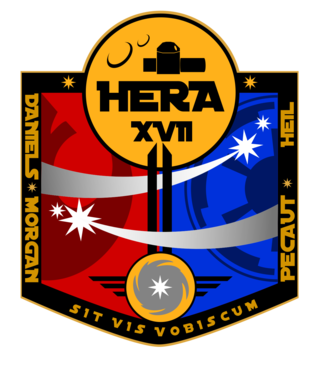 So, to reflect briefly on our HERA mission – I’m glad I did it, but I wouldn’t do it again. It was fun and also challenging. Some things were easier than I though they would be (sleep deprivation, liking the food, dealing with lack of privacy), and some more challenging (not having contact with friends and family, flight simulations). I learned an incredible amount, about performing flight simulations, growing hydroponic plants, and talking in radio lingo, just to name a few. Our crew faced challenges and conflicts, as can be expected, and the mission had me considering the values of different teamwork strategies and how to resolve disagreements. Between our scientific tasks, the crew bonded over board games (Scrabble) and movies (Lost in Space, Armageddon, Fawlty Towers), created an art gallery, and had weekly “Sophisticated Saturday” dinners. I was too tired to read most nights, but other habits were strengthened – stretching, hydrating, flossing, journaling, to name a few. We’ll see how well those continue back on earth. One of the biggest challenges of the mission for me was being away from my regular work as a climate and ecosystem scientist at University of Massachusetts. I think that being “off-planet” for so long enhanced my appreciation for the things on earth, and makes me want to double my efforts in environmental research and conservation awareness. When you are confined in a capsule, planet earth seems especially important and lovely, and it is. Take care of our planet, please, I’ll try my best to do the same. 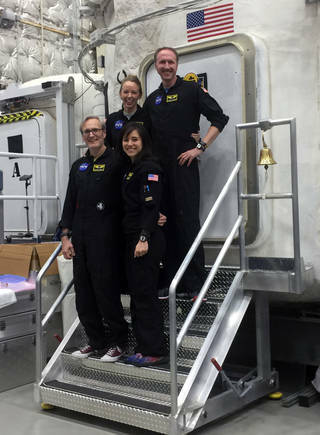 I am utterly impressed by the degree of teamwork, expertise, and commitment shown by my crewmates as well as by Mission Control and the researchers behind HERA. I’m grateful to have been part of such a big team, and with such a lofty goal. I certainly hope that our mission, HERA XVII, and the other flight analog missions going on around the world, really make space travel more safe and enjoyable and productive for our astronaut friends. I wish them luck. Thanks again to my crewmates from HERA XVII. It’s been a pleasure “flying” with you. Happy to have you home!